Student James Korossy (left) going over a film with his mentor, Dr. Lingbo Zhang. The spark that inspires researchers, engineers, doctors, and many others to turn science from an interest to a career can come from anywhere—a particularly engaging class in school, a thrilling documentary on TV, or even a book recommended by a librarian. For college student and aspiring researcher James Korossy, the scientific spark started by simply exploring what was right next door. Early in life Korossy was curious about biology and genetics, but had little idea of what studying those subjects really meant. 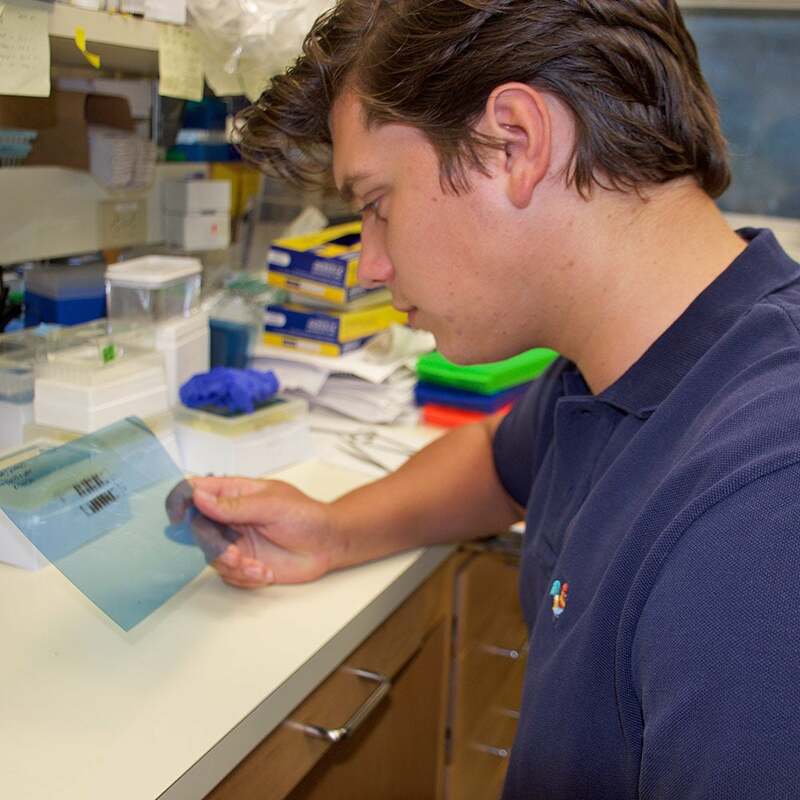 Living in Laurel Hollow with his family, he was only a few short minutes away from Cold Spring Harbor Laboratory’s (CSHL) Dolan DNA Learning Center, and his father thought it would be an easy way for the curious kid to further explore his interests. “By the time I was around nine or ten, my dad thought ‘James, we have this incredible institution right across from our doorstep, you should go and see what that’s like’” he explained. He enrolled in the annual Fun with DNA science camp in the summer of 2010, and was hooked on the hands-on experience it gave him. Korossy came back for several more Saturday DNA! programs, his favorite being a genomics lesson in which he studied his own genetic code and ancestry from mitochondrial DNA, linking together thousands of years of genetic history. Korossy at the lab bench. While he was learning more about the subjects that first piqued his interest, he was also looking to get back to that hands-on experience and take on new challenges. 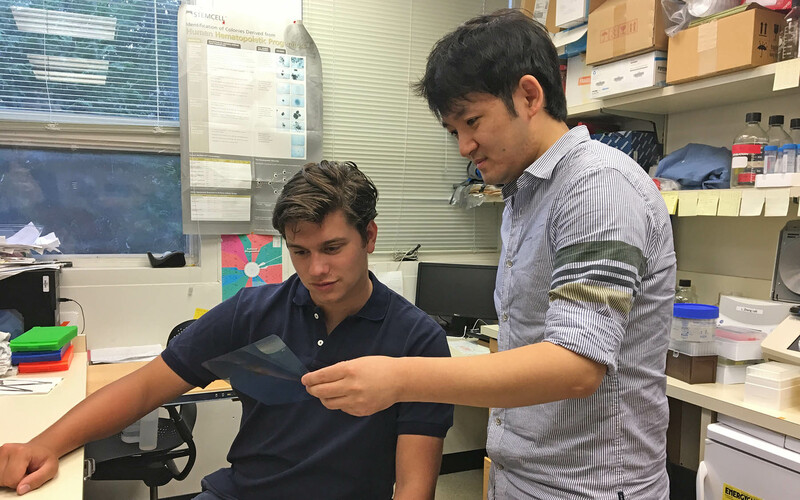 He applied to work in one of the CSHL labs, and was chosen to work with CSHL Fellow and cancer researcher Lingbo Zhang, who studies stem cell and leukemia. Korossy studied how knocking out a particular gene using CRISPR/Cas-9 in cancer cells in order to see how it affected it. Korossy is now a rising sophomore at the prestigious Imperial College School of Medicine in London. While other students might have used the summer break after their freshman year to recharge and regroup, James had other plans: returning to Zhang’s lab. He is currently working on the same project he started with, studying the same gene in the next phase of the experiment, and learning more under Zhang as he continues on the path to a future in biology research.